You guys, it’s been a hot minute since I’ve posted a recipe on here. You know that I’m not one for long and complicated recipes (unless it’s cheesecake which I would spend all hours of the day making), so I was thinking about posting more quick and easy recipes for you guys. Thoughts? Smoothie bowls have been my fun science experiment for awhile now and I love finding new combinations. For a couple weeks I was making all kinds of obscure flavors until one day it dawned on me that I hadn’t made one of the simplest and most delicious combinations of all time…peanut butter and jelly. Sometimes it’s all about simplicity. I literally came up with this idea and had it sitting in front of me in about 5 minutes. It’s SUPER simple and only has three ingredients! You need this in your life right now. I made my version with mixed berries, but you just as easily substitute whatever berries you desire. I think this would be pretty amazing with frozen strawberries since I am one of those weirdos who hates grape jelly. Anyone else? If you’re as equally obsessed with smoothie bowls as I am, make sure to check out my post on the steps to a perfect smoothie bowl. Enjoy! Combine all ingredients minus toppings into a blender and blend until smooth. Add desired toppings. I made this peanut butter drizzle by microwaving 1-2 Tbsp of peanut butter for about 15-20 seconds, then just drizzling over the top. It seriously made this bowl. 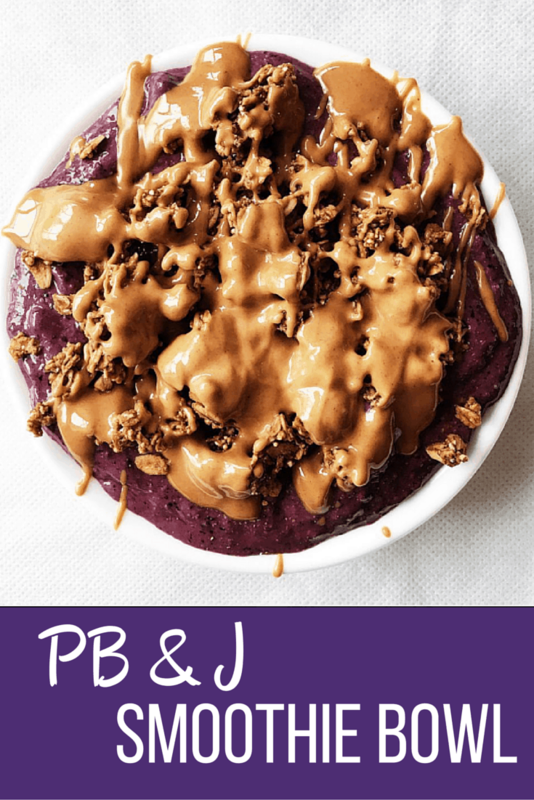 Super fast and SUPER delicious 3-ingredient PB and J smoothie bowl! What other simple combos am I overlooking? Do you want to see more recipes like these on the blog? Where did the phrase “hot minute” come from? That is your mission for the day. Also, make me one of these, my throat feels kind of raw. I’m all about delicious and quick recipes too! I actually love grape jelly most and dont like other jelly that much! I also like honey and cinnamon added to smoothie bowls! So delicious! Ooh that sounds delicious. I need to add some of that too! Yes to more recipes! 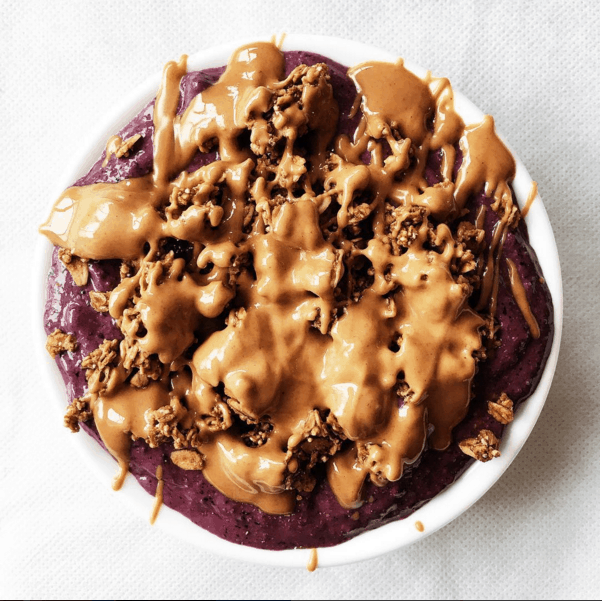 I love the simplicity in this smoothie bowl recipe. I love adding cinnamon and dates to smoothies for extra flavor. That sounds great too. Ok good I’ll add some more to the lineup! Whenever I use mixed berries in smoothies, I feel like my smoothie winds up all seed-y. Is that just me? Regardless, I would definitely make this with strawberries and happily stuff my face. If I blend it for a long time it minimizes the seediness but I know what you’re talking about. Try it with strawberries!! I loooooooooooooooooooooooove your food pictures. This bowl looks mouth watering! Thank you! It’s really quick and delicious! Agreed. I think my favorite is smuckers cherry jelly which not all stores carry! When I was a kid I hated jelly. My mom made me PB and Honey sandwiches, also a great combo! Now I love fresh berries and PB though. Funny how our palettes change. Ooh that sounds delicious too. I’ve never had one of those! That needs to be remedied.